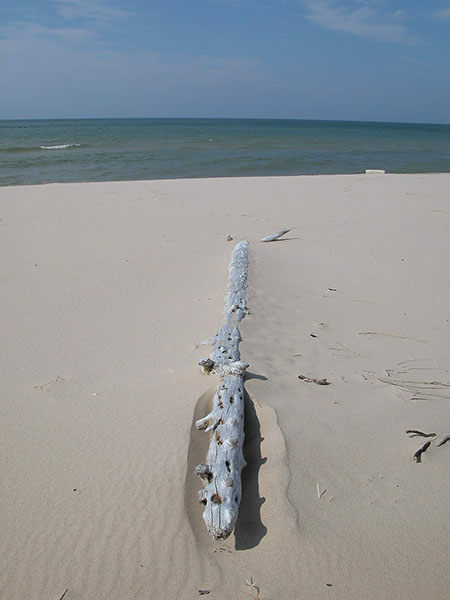 With the Michigan Wilderness Act of 1987, the federal government declared the Nordhouse Dunes area of the Manistee National Forest a wilderness, the only area designated as such in the Lower Peninsula. Nordhouse Dunes is not a large tract—only 3,450 acres—nor is it a pristine setting. The area is crisscrossed in places by old logging tracks and Forest Service roads. True wilderness or not, though, there is no question that this niche of windblown dunes, wetlands, and rolling hills of hardwoods and conifers is a unique spot for southern Michigan and even for the western side of the state, which is famous for having the world’s most extensive set of freshwater dunes. The most striking feature of this area is its undeveloped nature, most notably along the 4 miles of Lake Michigan shoreline. Paralleling the shoreline are open dunes and forested bluffs, and skirting the edge of these is a foot path that at one time was called the Michigan Trail. 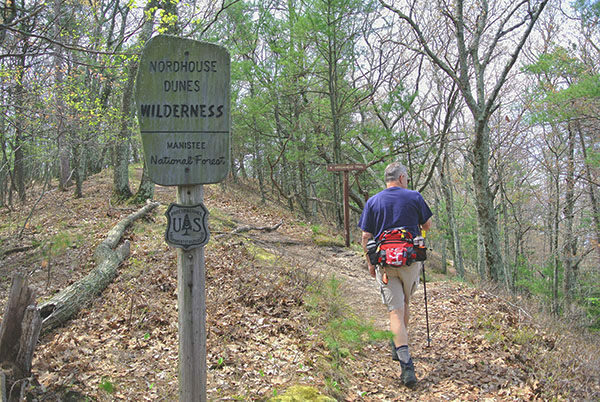 In the nature of a true wilderness, Nordhouse Dunes was stripped of its signs, markings, and even names for trails. But this path is worthy of its title. 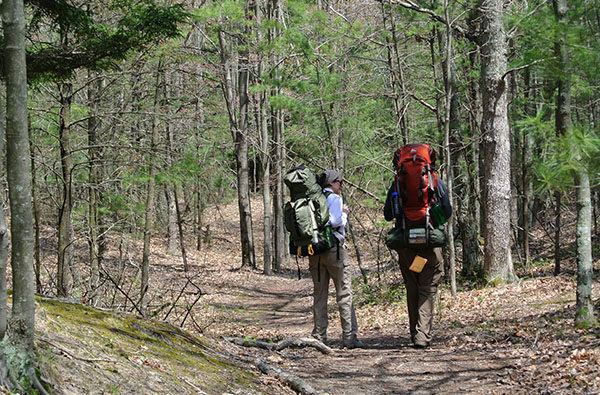 Lying like a thread between the roar of the Lake Michigan surf and the quiet interior of the forests, this route is not only one of the most scenic hikes in Michigan but possibly in the Midwest. 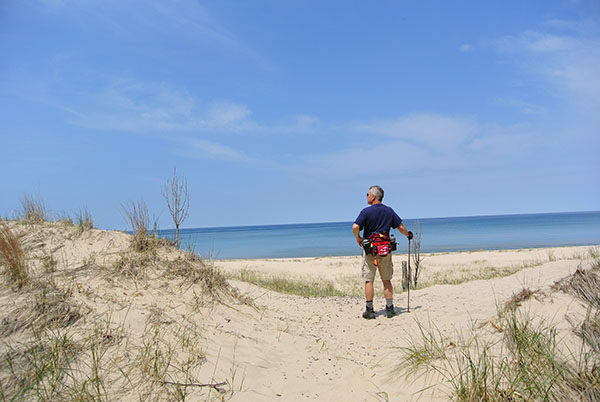 The actual trail stretches 1.9 miles from the Lake Michigan Recreation Area to a stretch of open dunes. You then complete this 6.5-mile loop by following a trail to the Nurnberg Road trailhead, where you pick up another path to the campground. Alternatively, spurs allow you to depart the shoreline earlier and shorten the hike to either 2.4 miles or 5.5 miles. Encounters with people are also likely, especially during July and August or on trails near the Lake Michigan Recreation Area. To reach the trailhead at the Lake Michigan Recreation Area, drive through the campground to a parking lot at the end that features an information display and a boardwalk. One end of the boardwalk heads to the beach, the other towards the shoreline bluff to the south (left). The trail slides the bluff, gradually ascending the top of it. Within a quarter mile you pass a log stairway to the beach below and at Mile 0.35 arrive at the posted junction with the Arrowhead Trail that heads inland (left). Head southwest (right) to officially enter the federal wilderness. The trail continues along a dune ridge high above the shoreline and is surprisingly level and easy walking for the first mile. On one side are dunes forested in hardwoods, pines, and an occasional paper birch. On the other side is a steep drop, a strip of white, sandy beach, and the blue horizon of Lake Michigan. The forest is composed mostly of northern hardwoods such as maple, beech, and white and red oaks, with hemlock and red and white pines mixed in. At Mile 1, however, you pass through a scenic stand of paper birch, and pass the second crossover trail which is not posted and can easily be missed. This spur is a 0.7-mile walk to the return trail of this hike. The shoreline trail continues south (right) and immediately ascend along an embankment stairway that quickly passes the third junction of the day. You climb several more humps along the shoreline dunes before making a long descent to the fourth junction, reached at Mile 1.8. This area is the most popular for backpackers to set up camp, thus the maze of social trails here that lead to the beach or further into the woods. Though not posted, the crossover trail is a former two-track that heads south (left) and is easier to distinguish than the others. If you continued southwest (right) the shoreline trail would lead you out of the woods to an impressive blowout of open sand. The southern half of the Nordhouse Dunes is trailless, but adventurous hikers can continue southwest by following the beach. In a little over 2 miles, you would leave the federal tract and enter Ludington State Park’s Wilderness Natural Area, a 1,699-acre extension of this undeveloped segment of Lake Michigan shoreline and end up at the Big Sable Point Lighthouse. This trail description, however, follows the old two-track south. The trail is wide and easy to follow, passing another former two-track that heads northwest (left) at Mile 2.4. Continue south and at Mile 2.6 will pass yet another old road that crosses the trail and climbs steeply up a hill. This junction can be a bit confusing but head left and then right to remain on the described route, a wide, sandy path that makes its own long ascent. You follow with an equally long descent, after which the trail curves around a large marsh with an open pond in the middle. The main trail then swings noticeably to the east, passes another old road and at Mile 3.6 descends gently to the trailhead and parking area off Nurnberg Road. The trailhead features vault toilets and an information display but no source of drinking water. Pick up the next segment by crossing the parking area to the north to the path marked by a no motorized vehicles sign. 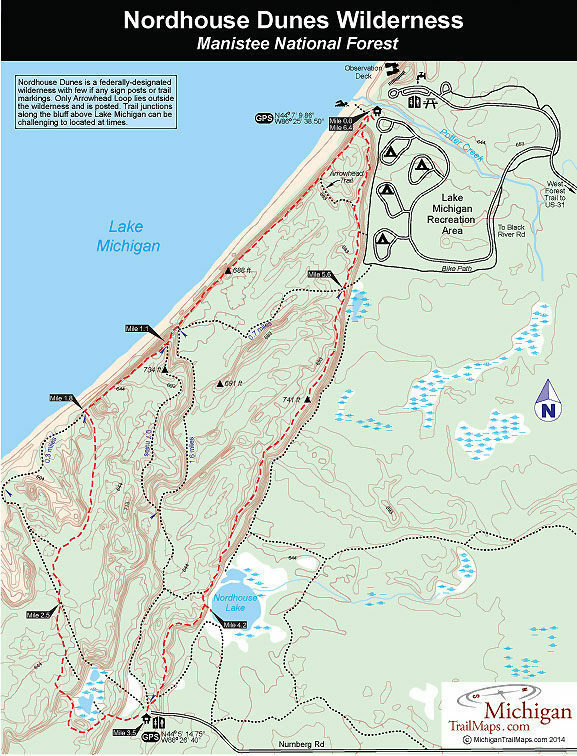 This path is the main route back to the Lake Michigan Recreation Area and is a scenic hike as you straddle the crest of a series of wooded dunes almost all the way back to the campground. You immediately pass a junction with one of the crossover spurs that heads northwest (left) and then within a few hundred yards a trail that heads northeast (right) for Nordhouse Lake. Stay on the main trail, a wide, easy to follow path, and at Mile 4.3 will arrive at a clear view of the lake with a short spur dropping to its shoreline. Just beyond the lake is a junction with a crossover spur to the west (left). The main trail resumes following the edge of the bluff, passing another crossover spur to the west (left) at Mile 5.7. Less than a quartermile later, a spur that drops sharply off the bluff to the campground below. The main trail begins climbing steadily, reaching an open highpoint of 713 feet, where a watertower once stood. The Arrowhead Trail departs to west (left) here. Stay right and follow the main trail as it skirts a narrow ridgeline. You descend the bluff from this spot along one of two trails, both are steep and caution needs to be used, especially if you’re hiking with young children. You bottom out at a trail and then the boardwalk that leads back to the trailhead parking area, reached at Mile 6.5. 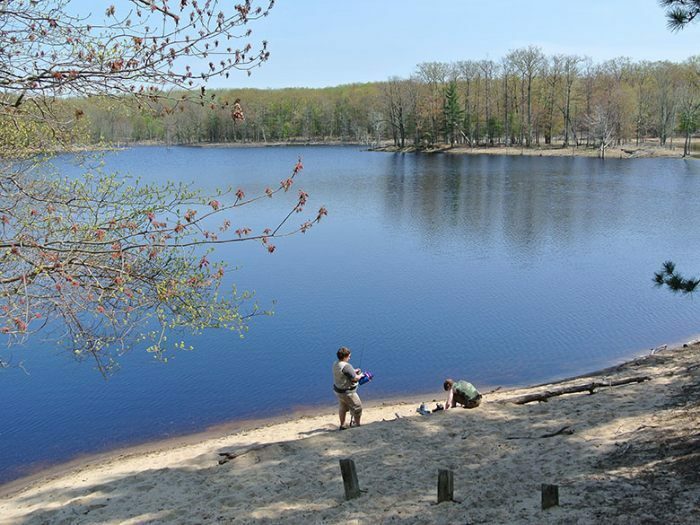 The Lake Michigan Recreation Area features 99 rustic and wooded campsites well spaced along four loops. There are hand pumps for water, fire rings, and picnic tables, but no electricity or showers. The area is open year-round and managed from mid-May to mid-October. There is a nightly campsite fee. Due to the fragile nature of the open dunes, campfires and camping are discouraged, but nearby are pockets of conifers or hardwoods that are excellent places to set up camp for a night. Carry in all your water and a backpacker’s stove to make life easy in the woods, and carry out all your trash. A Huron-Manistee National Forests vehicle permit is required to hike into Nordhouse Dunes and can be obtained at the trailhead or from the Cadillac/Manistee Ranger District. 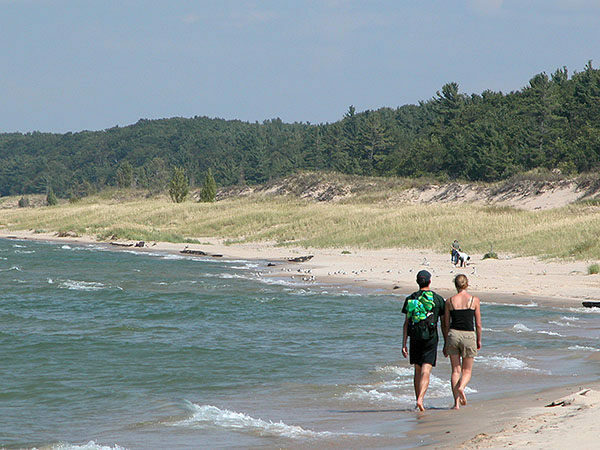 The Lake Michigan Recreation Area is at the northern edge of the federal wilderness and located almost halfway between Manistee to the north and Ludington to the south. From M-55 in Manistee, head south on US-31 for 10 miles and then turn west (right) on Lake Michigan Road for 8 miles to its end. From US-10 turn north on US-31 at Scottville, 7 miles east of Ludington. Lake Michigan Road is reached in 11.5 miles. The tract’s 10-mile network of trails is also accessible from a trailhead at the west end of Nurnberg Road. From US 31, head west on Lake Michigan Recreation Road for 3 miles, then head south (left) on Quarterline Road for a little over 1 mile to reach Nurnberg Road. Three trails marked by U.S. Forest Service signs and one with a display map depart from here. Make sure you have water before you arrive, for the trailhead contains only a parking area for your vehicle. Contact the Cadillac/Manistee Ranger District (231-723-2211; www.fs.usda.gov/main/hmnf) or stopping at the ranger station located at 412 Red Apple Road just off US-31 and south of the town of Manistee.